Motobirds, a 1970s all-girl motorbike stunt team from Leicester, have recently re-captured the public imagination. The group re-united for an appearance on BBC One’s The One Show which aired on 1 April 2016. They hadn’t seen each other for forty years. The Motobirds ‘travelled all over the UK and Europe, did shows with the Original American Hell Drivers in Denmark, Sweden, Norway, Iceland, etc. We were originally four, then six, then fourteen girls. We performed motorbike stunts, car stunts and precision driving, and human cannon. We were eventually followed by the Auto Angels, an all girl group from Devon or Cornwall. I don’t know of any other all girl teams’, remembers founding member Mary Weston-Webb. Motobirds were notoriously daring, and wore little or no protective clothing. The BBC article offers this sobering assessment: ‘most of the women’s stunts would horrify modern health and safety experts’. We were pretty overjoyed in the Great Bear studio when Mary Weston-Webb, the driving force behind the recent reunion, sent us a NTSC uMatic video tape to transfer. The video, which was in a perfect, playable condition, is a document of Motobirds strutting their stuff in Japan. Thank you Mary for telling us the story behind the tapes. copy umatic tape, digitise via dub connector or composite video? Digitising legacy and obsolete video formats in essence is simple but the technical details make the process more complex. Experience and knowledge are therefore needed to make the most appropriate choices for the medium. 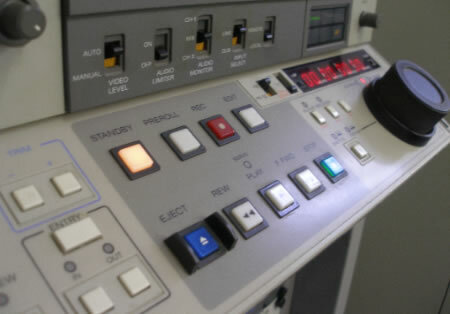 The umatic video format usually had two types of video output, composite and a y/c type connector that Sony named ‘Dub’. Originally designed as a higher quality method to make analogue ‘dubs’, or for connections in an edit suite, the Dub connector offers a higher performance signal path for the video signal. It would make sense to use the higher quality dub output when digitising umatic tapes but here lies the problem. Firstly the connector uses the larger 7 pin y/c type connector that can be quite hard to find connectors for. Secondly and most significantly, the chrominance subcarrier frequency is not the standard PAL 4.43Mhz but down converted by umatic recorders to 0.686Mhz for low band recordings and 0.984Mhz for high band recordings. What this means in practice is that you’ll only get a monochrome image using the umatic dub connector unless you can find a way to convert the chroma subcarrier frequency back to 4.43Mhz. Convert this Dub signal chroma frequency using one of a few older Timebase Correctors / Frame Synchronisers from the umatic era. These are now rare and often have other other faults that would degrade the signal. Take the Luma and Chroma signals at the correct frequency directly from certain test points on the circuit boards inside the machines. This can work well but is a slightly ‘messy’ solution and makes it hard to swap machines around, which is a necessity with older hardware. 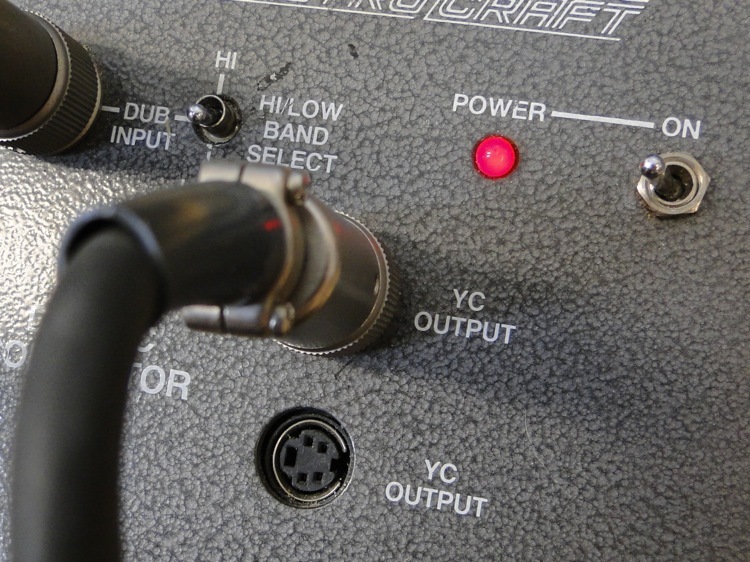 Convert the dub signal using a dedicated external dub – y/c converter circuit. This is our preferred solution that works well technically. It is flexible enough to swap around to different machines easily. It is also a relatively simple circuit that is easy to repair and doesn’t subject the video signal to unnecessary extra processing. Below are two stills taken from a Apple ProRes recording from a Low Band Pal u-Matic tape. The first image is via the Dub connecter but converted to PAL Y/C. The second images is via the Composite video out. It’s clear from the images that there is more fine detail in the picture from the u-matic Dub version. The pattern / texture in the jacket and the texture and tone in the face is more detailed. 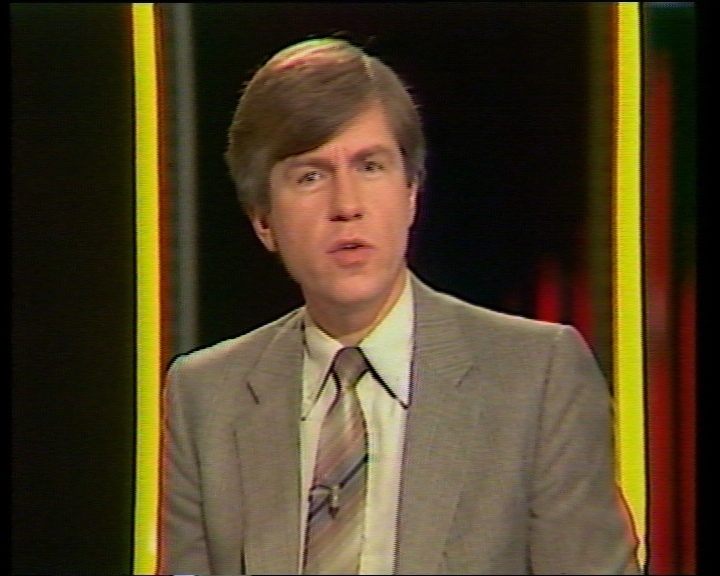 In contrast, the version digitised through the Composite video connector has less noise but due to the extra encoding and decoding there is less detail and more ‘blurring’. While less noise may be preferable in some instances, having the option to choose between these two is always better. It’s this kind of attention detail and investment in equipment and knowledge that we are proud of and makes us a preferred supplier of digitising services for umatic video tape. We have recently completed a job for Quarry Faces, the Mendip Hills Community Heritage Project which has been funded by the Heritage Lottery Fund. Quarry Faces gave us 20 u-matic video tapes that were commissioned for a corporate video in the 1980s. The Quarry Faces project aims to tell the industry’s story, produce teaching materials for both educational purposes and general interest, and create an archive to preserve images and memories of quarrying over time. This video we digitised was shot by Coloroll Films of Kilmarnock in 1985, and was delivered to us on u-matic tape. It features a giant walking crusher at Foster Yeoman’s Merehead Quarry (Torr Works). Walking Crusher at Foster Yeoman Ltd’s Torr Works in 1985 from Quarry Faces on Vimeo. The video tapes we were sent were high band recordings, rather low band and of very good quality. One AMPEX U-matic tape however was problematic as the tape shell / mechanism had degraded over time and needed careful hand rewinding and reshelling in a known good and newer cassette shell. When faced with damaged tape, often people automatically assume it needs dehydrating, a process that forces the moisture out of the tape through stable, precise, low temperature baking. However if this is not what is wrong with the tape, dehydrating or ‘baking‘ as it is more commonly called, may in fact damage the tape. If you bake acetate tape that was commonly used in the 1950s and 1960s for example, it would be destroy it. Ampex filed for a patent for the correct temperature to recover Ampex tapes. 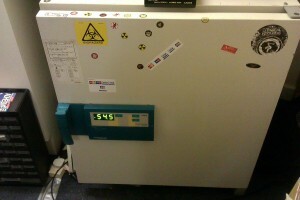 The patent referred to “a typical temperature used is 54’C. and a typical effective time is 16 hours”. The simple truth is, there is no all encompassing answer to know what happens to tape when it degrades, or when the cassette shell mechanism malfunctions, and each tape that is sent to us is of course individual. Digitisation and the art of restoring old tape is a relatively new area, and no one has yet made a machine that is able to precisely diagnose what is wrong with each individual tape when problems occur. Is the tape suffering from sticky shed syndrome or binder hydrolysis, or is it ‘vinegar syndrome’, a condition which afflicts acetate tape? Only through careful diagnostic work, which at Great Bear includes using our range of in-house test tapes, can the correct remedy be found. 2 u-matic video tapes were discovered of a Black Roots live performance in Bristol in the 1980’s. We were able to restore, digitise and make the umatic transfer of this recording as a high quality, uncompressed Quicktime file then encode and author a DVD for future release by Bristol Archive Records. Black Roots were Bristol’s premier Reggae band throughout the eighties and having gone their separate ways in the nineties they reformed last year and will be rekindling the magic with an intimate hometown gig at the Fleece on Friday September 9th, the show coincides with the release of “Black Roots – The Reggae Singles Anthology”, released on Bristol Archive Records in collaboration with Nubian Records, this release showcases all of the band’s singles released during their first decade and as an extra bonus the CD issue comes coupled with a DVD of the band’s 1986 video release “Celebration” recorded at the long gone Studio nightclub in Bristol. This show will be something special and likely sell out so book your tickets early and don’t miss out. Unseen to 32 years, although there could possibly be other tapes in the vaults at Abbey Road. This ntsc umatic transfer to uncompressed quicktime files was a damaged tape that at some point in it’s life had been ‘eaten’ by a greedy u-matic machine! The tape shell also had some plastic debris inside that needed removing before it was safe to attempt loading and migration. We’ve been honored recently to have won a large contract to help in the digital migration of an extensive educational video archive by the transfer from U-matic archive copies to uncompressed video files. While the archive had been stored in an suitable environment and rarely if at all played, they had not survived well. The Sony branded tapes from the 1970’s and 1980’s all exhibited binder hydrolysis or sticky shed syndrome. We were still able to get good transfers though using our range of umatic machines, particularly the Sony BVU-950P and For-A Time Base Corrector. You are currently browsing the greatbear analogue and digital media blog archives for June, 2009.